OK, so paddle boarding looks pretty cool right? Ever try standing on one? HiLife is MUCH more stable than one that looks like a surf board. What if you want to sit down and relax? HiLife has a great seat and backrest, there's even a cooler underneath! Swim decks make exit and re-entry for kids and pets a breeze, and the track pads on the bow, midship and stern help you keep your footing while paddling. A multipurpose track runs from bow to seat and acts as a slide track to mount your recreation and fishing accessories. The multipurpose track also doubles as a carry handle for easy transport. We recommend you buy a HiLife with a convertable paddle; good for standing up or sitting down. HiLife is very affordable, so there's nothing keeping you from your active lifestyle. This model is made in the USA by Perception kayaks. Also available in an Angler model. Length: 11' Width: 34" Weight: 53 lbs. Max Load: 280 lbs. You may call 1-800-452-9257 to place your order. Offering performance and stability, all in one compact, user-friendly design, the Swiftwater 10.5 crossover kayak is ideal for many conditions from very calm waters up to Class II rapids. A great choice for a beginner or intermediate paddler who wants a versatile kayak that also easy to load and transport. Swiftwater has a well thought out cockpit area to promote proper paddling techniques for a range of paddler sizes. Through our Try-Before-You-Buy program our customers tell us the Swiftwater is very stable and has a better blend of both tracking and maneuverability than other kayaks they've tried. Check out the defined shape on the ends, this is why there is very good tracking compared to other compact kayaks. Notice the rocker profile, this provides easy turning within a compact area. Unlike many BOX STORE kayaks (which are molded too inexpensively to have a proper cockpit lip); the Swiftwater may be fitted with an optional cockpit cover or spray skirt. A good sprayskirt is crucial if you intend to run rapids. This model is made in USA by Perception Kayaks. Includes a nice padded seat, adjustable padded backrest, rear hatch, sealed bulkhead for safety (EXP model only), adjustable footbraces, deck rigging and knee pads. Swiftwater specs: Length: 10' 6" Width 30" Weight: 43 lbs. Max Load: 300 lbs. Shown above is the Acadia 11.5 EXP in Sunset color. Also available in our special color which is a mix of Blue and Lime. The Acadia is likely Perception's most famous model of all time. This is because the Acadia has an uncommon amount of glide, tracking, stability and room in the cockpit when compared to bagain outlet kayaks. The unique "Stabilizer Hull" is designed to enhance tracking AND make this boat very stable, especially while getting in or out of the boat. It has a perfectly sized cockpit opening providing plenty of room to maneuver and access your gear without being overwhelming. Compared to those box store kayaks Acadia 11.5 has more depth, which means the top of the kayak is not as close to water level, making for a drier ride. This is particularly important if you plan on putting an adult into a 9 or 10 foot kayak. The perfect kayak for beginners to start a lifetime of memories. Sealed bulkhead for safety (EXP model only). Acadia 11.5 specs: Length: 11' 3", Width: 28", Cockpit: 38" x 21", Weight: 46 lbs, Skill Level: Beginner - and up, Capacity: 365 lbs. The Streak 9.5gtx is a great pick for a solid, do it all kayak. The wide, flat bottom shape provides plenty of stability. See how this one tracks much better than some other short kayaks yet the rounded bow and compact size means it's still easy to turn. Streak also has the famous Perception groove channels in the bottom which keep it from denting easily like so many of those box store kayaks. This model is made in South Carolina, USA by Perception Kayaks. Shown here in our Lime/Black color. We also stock an Angler version. Sturdy Highback padded backrest, Comfort Padded seat, Adjustable footbraces, Deck bungees, Carry handles, Knee pads. Streak specs: Length: 9 6 Width: 29 Weight: 36 lbs. Max Load: 300 lbs. We stock a version with a molded-in dashboard (shown left), a version with an open cockpit (shown center) and to the right is the open cockpit with the optional console. The Wilderness Systems console may be added to the open cockpit Swifty, this includes a dry hatch and a cupholder and two trays. This console is held on by a bungee cord under the cockpit rim, so it is very easy to put on the kayak or remove. This is the Swifty deluxe 9.5 it's more stable, better tracking and enough room for an adult paddler when compared to so many of those other box store kayaks. It has a large cockpit opening providing plenty of room to maneuver and access your gear. This Swifty deluxe 9.5 has more depth, which means the top of the kayak is not as close to water level, making for a drier ride. A good solid kayak for beginners to start forming a lifetime of memories. "Swifty deluxe 9.5" kayak by Perception. Swifty deluxe specs: Length: 9' 6", Width: 30", Cockpit: 55" x 22", Weight: 44 lbs, Skill Level: Beginner - and up, Capacity: 300 lbs. Shown above is the new Patriot 120 EXP in sand color. The Patriot is wide, rugged and spacious. This is a solid choice for medium to Larger sized paddlers. It has a molded-in square skeg in the stern so it tracks much better than short kayaks. Patriot also has the famous Perception groove channels in the bottom which keep it from denting easily like so many of those box store kayaks. The basic and the EXP version have a large rear hatch; the EXP also includes a sealed bulkhead for storage and safety (extra buoyancy). Patriot specs: Length: 11' 10" Width: 29.5" Weight: 48 lbs. Max Load: 400 lbs. Shown above is the new Patriot 120 EXP Angler in sand color. The EXP version has a large rear hatch with a sealed bulkhead for storage and extra buoyancy. This model is made in the USA by Perception kayaks. This is the Angler version. Patriot angler specs: Length: 11' 10" Width: 29.5" Weight: 48 lbs. Max Load: 400 lbs. The Tribute's performance and ergonomics have been designed to specifically fit smaller women. The Tribute is effortless to paddle yet is stable and very comfortable. Light enough so that anyone can load it on their vehicle. Available in 10 and 12 foot poly models. like wearing your big brother's size 14 boots -you may want to check out our Tribute! Tribute 10.0 EXP 10' 26" 36 lbs. 225 lbs. Tribute 12.0 EXP 12' 24.5" 42 lbs. 240 lbs. The 12.0 is the perfect size to easily load and offers dry storage for gear to make the most of its capabilities. The new Zone Deluxe outfitting provides superior comfort and customization. Length: 12' Width 26" Weight: 49 lbs. Max Load: 275 lbs. The Carolina 14 has all the features you need for day paddling with more storage capacity to handle longer trips. Length: 14' Width: 24.5" Weight: 57 lbs. Max Load: 300 lbs. The value leader; before you waist your money at the box store you need to paddle our Pescador 10.0, it's a versatile sit-on-top kayak for paddling or fishing. The Pescador is a self-bailing hull design... any water that splashes over the top passes thru the scupper holes without filling up the inner hull. -This means you'll always have a safe and buoyant ride. Plenty of speed and capacity for any size paddler to enjoy a full day on the water. (please do NOT trust the capacity on those box store kayaks). Also available in Angler version. Pescador 10.0 10' 6" 32" 57 lbs. 325 lbs. A renowned performer, the Pescador PRO 10 is the ultimate in versatile sit-on-top kayaks. 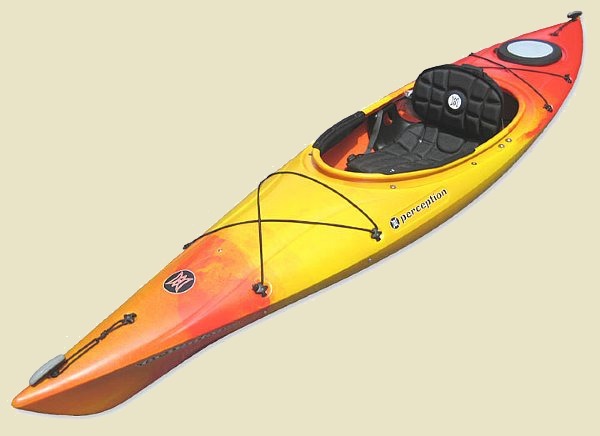 A terrific all around kayak for lakes, ponds, rivers and streams. Pescador is a self-bailing hull design... any water that splashes over the top passes thru the scupper holes without filling up the inner hull. Removable PRO Seat features 2-level seat adjustment and breathable mesh for the ultimate ride. Pescador Pro 10 10'6" 32" 57 lbs. 325 lbs. The value leader; before you waist your money at the box store you need to paddle our Pescador 12.0, it's a versatile sit-on-top kayak for paddling or fishing. Pescador 12.0 12' 32.5" 57 lbs. 375 lbs. A renowned performer, the Pescador PRO 12 is the ultimate in versatile sit-on-top kayaks. A terrific all kayak for lakes, ponds, rivers and streams. Pescador PRO 12 12' 32.5" 64 lbs. 375 lbs. The Swiftwater tandem is our choice for a basic tandem kayak with good stability. Our Swiftwater tandem is made in USA by Perception Kayaks and comes with nice padded seats with an adjustable padded backrest and adjustable footbraces. The forward seat adjusts, so you can slide it back to use this craft solo, slide the seat forward to use as a tandem! This feature also helps to accomodate one partner that may be taller than the other. Length: 13' 10" Width 30.25" Weight: 74 lbs. Max Load: 475 lbs.